David Beckham, one of the best soccer players of all times, once said.“Soccer is a magical game.” But, what is it that makes it so magical? Is it the rush of adrenaline that the players feel when playing and the feeling of the need to defend their pride? Or the happiness that the fans feel when watching, knowing that their players are defending their country at all costs? These and many other things are what make soccer the “magical” sport. Those who practice this sport have the prestigious privilege of calling themselves “the soccer magicians.” There is evidence to prove that soccer is, indeed, the most magical of all sports. With over 4 billion fans, (over half of the world) soccer is the most popular sport in the world. As a HUGE fan of soccer, I wanted to know what went on in the mind of a competitive soccer player. I had the wonderful opportunity of interviewing high-school soccer star, Michael Brunet. Michael is currently a senior attending the same school as me and proudly wears the number 15 on the varsity boys soccer team. With a sensational smile and an admirable attitude, he responded to all of my curiosities. 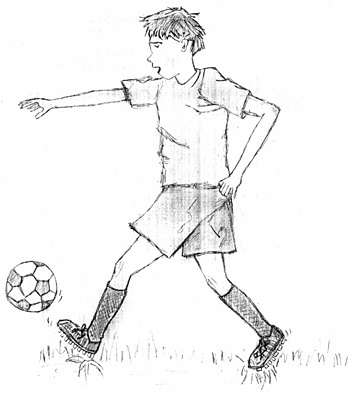 Q1) At what age did you begin playing soccer? -At 5 or 6 years old. Q2)Do you consider it just a hobby or do you call it your passion? Q3) Do you think soccer is a difficult sport? Why or why not? -Yes, it’s difficult because it takes a lot of cardiac and skill. Q4) What role does your family play in soccer? -My brother plays J.V(Junior Varsity) and so my parents give everyone rides when they need them. Q5) How do you describe yourself outside of the field? -Smart, honest, athletic, and outgoing. Q6) What is one thing you would criticize about soccer? Q7) What position do you play? Q8) What has been your worst injury- if you’ve had one? Q9) Do you feel content with the way that your school soccer team plays? -It could be better. We get along great. Q10) What is the best advice that someone has given to you and who has given it to you? -”Just keep working hard” -Coach Bryan. Q11) What is it about soccer that makes you want to play it? -I just love how soccer is a team sport and everyone works together. Q12) If there’s one soccer player that you look up to, who is it? Q13) If soccer didn’t exist, what sport do you think you would be playing? Q14) Do you watch professional soccer? Which is your favorite team? -Yes. My favorite is PSG (Paris Saint-Germain) because I’m French and I have family in France. Q15) Who do you prefer: Cristiano Ronaldo or Lionel Messi? -Messi, because he’s more humble. Q16) Are you going to watch the 2018 FIFA World Cup? Which national team are you going to be rooting for? -Of course. :) I’m going to root for France. Q17) Who do you think is most likely to win? Q18) What do of think of the U.S Men’s National Soccer Team when they lost by 2-1 to Trinidad and Tobago last year and was eliminated from the World Cup? -It was very disappointing. They could’ve done way, way better. Q19) What do you think of them in general? -I think their future is very bright. Q20) Set yourself in this position: You’re a coach and you have been offered to select any professional soccer players in the world to create your own team. You can only pick 3 forwards, 3 midfielders, 3 defenders, 1 sweeper, and obviously, 1 goalie. Which 11 would you pick? - Well, let’s see. The 3 forwards would be Lionel Messi, Cristiano Ronaldo, and Sergio Aguero. The 3 midfielders would be Christian Pulisic, Michael Bradley, and Kevin de Bruyne. For defenders, I would pick David Luiz, Marcelo, and Owen Nimchuck. The sweeper would have to be Gerard Pique, and the goalkeeper, Tim Howard. Q21) Why do you think that so many people around the world love and enjoy watching and playing soccer? -I think it’s because soccer’s been around for so long and because it’s a cultural sport. Q22) On a final note, would you please explain to me what it means to you to be able to participate in such an emblematic sport of the unity of people all over the world? -Even though I play soccer on a high-school level, I really like participating in soccer because of the competitiveness. It means so much to me to be able to play soccer. Without Michael Brunet, this interview would not have been possible. Thanks, Michael. Soccer runs through my veins, as it does through many others' as well, and I just had to conduct an interview to "pick the mind" of one of soccer's many "magicians." For me, soccer is the most magical of all sports. What do you think?